Boho Farm and Home: Still Loving Wallpaper! Some people think wallpaper is dated... but I go nuts over it, to me it is a classic! I put it in niches , hallways and powder rooms. I especially like it in the back of bookcases and cabinets. This is a bookcase that I use in my pantry, it is from a convent in Wisconsin and it came with that cute striped wallpaper in it! See even the sisters like having a little wallpaper. Classic French Clarence House in the hall bath--I've had this for 13 years and still love it! Unfortunately, this project put him over the edge and years later he is still talking about that crazy door I dragged home and how he had to "fix" it. So now I have to be "selective" in what I bring home, if I want him to do his magic on it! I am going to put it in my office for a little pop and inspiration! I really have a thing for green these days. I just painted my office in Dunn Edwards "Spanish Olive", bright but soothing. 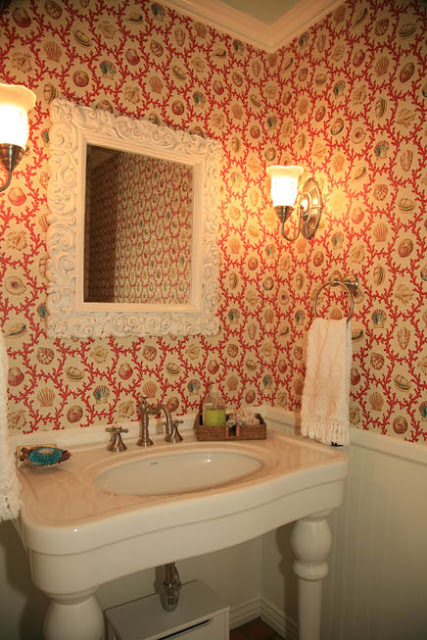 And here is my client's powder room...I won her over to the wallpaper side too! Doesn't it just look like a little beachy jewel box with the robin egg blue ceiling and beadboard? Do any of you heart wallpaper too? Oh wow.....i am in love.....all of it's wonderful! i am planning on putting some wallpaper in cabinets and bookcases too...i love that look! all your paper in your rooms looks so beautiful, i just love your claw foot tub. 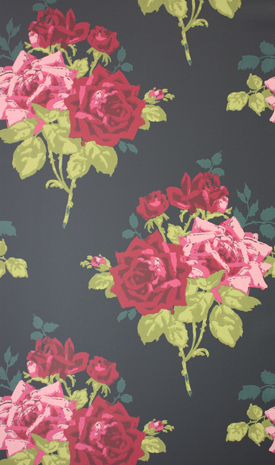 that Nina Campbell paper is so pretty...show us how it turns out in your office! I like wallpaper in other people's homes just not mine! I would get tired of the same pattern. Besides, I know Ben is not a fan. I might entertain the idea of putting it in my kitchen cabinets though, where you don't see it all the time. Ah... everyone of them, so pretty! Very pretty! I love how you used it in the back of cabinets. That's a manageable amount. I haven't had it in my house in a while but I am rethinking this with your post! Thanks so much for visiting me at katiedid! Very glad to visit your blog! Yes, I do love wallpaper and just got the latest update from Thibault....fantastic! just found your blog and I'm loving it! I have to admit, I've gotten rid of most of my wallpaper. But seeing yours has me rethinking that decision. Beautiful! !